Image search site Pinterest Inc. filed for an initial public offering amid a burst of activity among soon-to-list technology-related companies in the U.S.
Pinterest plans to list its shares as soon as April, a person familiar with the matter said Thursday. The San Francisco-based company filed Friday with an initial offering size of US$100 million, a placeholder amount used to calculate fees that’s likely to change. 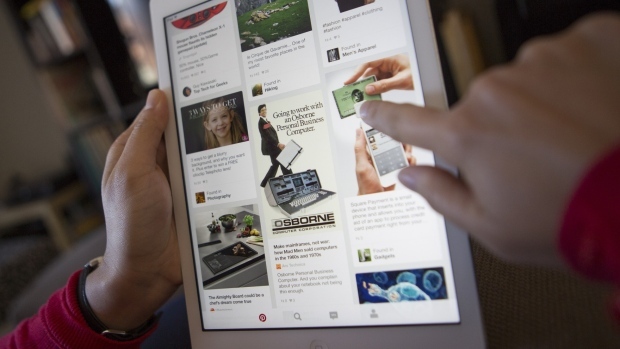 While the proposed terms of the share sale won’t be disclosed until a later filing, Pinterest could raise about US$1.5 billion in an IPO valuing it at at US$12 billion or more, people familiar with the matter have said. The share sale will be led by banks including Goldman Sachs Group Inc., JPMorgan Chase & Co. and Allen & Co., according to the filing Friday. It applied to list on the New York Stock Exchange under the ticker PINS. Pinterest will have a dual-class structure, with its Class B shares carrying the voting rights of 20 ordinary shares. The company raised US$150 million in a private funding round in 2017 for a total valuation of about US$12.3 billion. Pinterest confidentially shared its IPO plans with the Securities and Exchange Commission earlier this year. Pinterest has experienced "significant growth" in users and monetization over the last several years, it said in the filing. It also said it has grown quickly in international markets by localizing content. The company said it lost US$63 million on revenue of US$756 million in 2018, compared with a loss of US$130 million on US$473 million in 2017. Founded in 2010, Pinterest is among the longest-lived of Silicon Valley’s unicorns -- startups with a valuation of more than US$1 billion -- that are lining up to go public this year or soon after. Lyft Inc.’s IPO, in which it is seeking to raise US$2.1 billion, is set for March 28. Its larger ride-sharing rival, Uber Technologies Inc., is expected to submit its public filing in April for an IPO on the NYSE that could value it at as much as US$120 billion, people familiar with the matter have said. Other tech and app-driven companies that are considering listing this year include food delivery company Postmates Inc. and Slack Technologies Inc.